From the old town Besalu by the river of Fluvia I present today a photo of a happy family by the shores of the river out fishing on this fine Sunday in May. 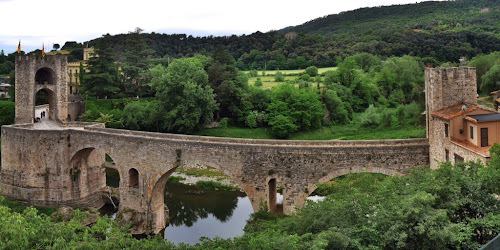 Besalú is a town in the comarca of Garrotxa, in Girona, Catalonia, Spain. Besalú was designated as a historical national property ("conjunt històric-artístic") in 1966. The town's most significant feature is its 12th-century Romanesque bridge over the Fluvià river, which features a gateway at its midpoint.